eggs into rather a stiff paste, roll it out, not very thin, cut out with a small cutter- Bake in a slow oven. Baking Powder 5 oz ground rice 4 do Carbonate of Soda 3 do Tartaric acid Cake. 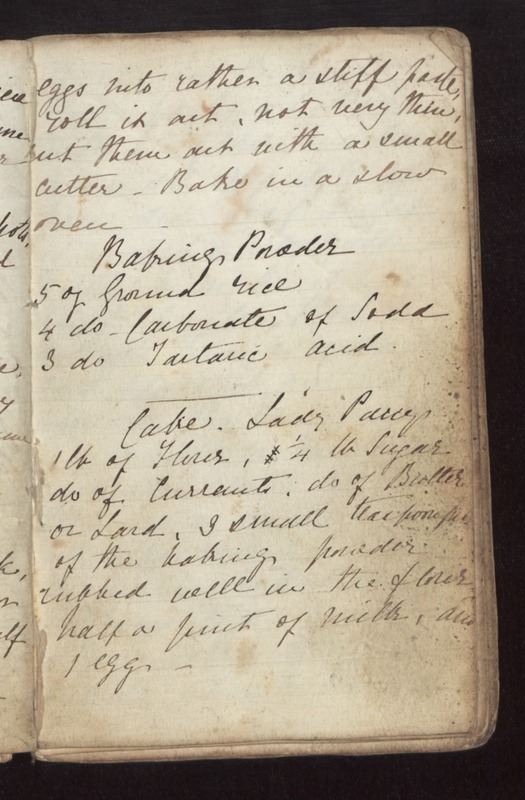 Lady Percy 1 lb of Flour 1/4 lb Sugar do of Currants do of Butter or Lard. 3 small teaspoonfuls of the baking powder rubbed well in the flour, half a pint of Milk, and 1 egg.